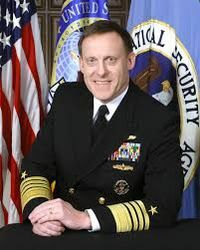 Admiral Michael S. Rogers served as Director of the National Security Agency (NSA), Commander of the U.S. Cyber Command (USCYBERCOM) and Chief of the Central Security Service (CSS) under Presidents Barack Obama and Donald Trump. Adm. Rogers discovered the Obama administration's misuse of the NSA's FISA database and reported the abuse to the FISA court. Nine days after the 2016 Presidential election Dir. Rogers informed President-elect Donald Trump of the Obama administration's illegal wiretaps on the Trump campaign and Trump transition team. Defense Secretary Ashton B. Carter and Director of National Intelligence James R. Clapper Jr. recommended firing Rogers. Obama considered doing so but ultimately did not. President Trump retained Rogers in his administration. ↑ Sanger, David E., et al. "Top Officials Urge Obama to Remove N.S.A. Leader." New York Times, vol. 166, no. 57422, 20 Nov. 2016, p. 27. EBSCOhost. This page was last modified on 23 June 2018, at 11:12.